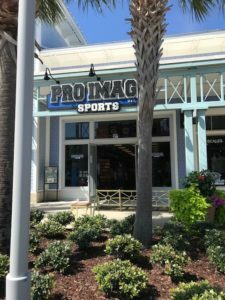 PANAMA CITY BEACH, FL- Pro Image Sports owner Shena Walsh has enjoys the brief drive from nearby Lynn Haven to work at Pier Park Mall from the beachfront condo she shares with husband and business partner Bryce. She’d grown accustomed to the familiar scenery of tourists packing the beaches and businesses along the way. Hurricane Michael hit the area October 10th and changed Shena’s walk forever. 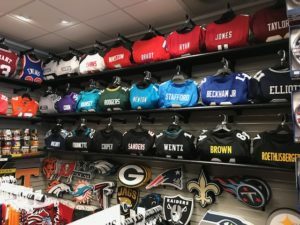 The Walsh’s Pro Image Sports store at Pier Park Mall was closed for 12 days after Hurricane Michael. The tourist hot spot is home to 12,000 residents year-round. Much of the destruction occurred across the — Bridge in Panama City. Many of the local business owners live in Panama City, as do their employees and customers. When the fundamentals of life such as electricity, housing, water and food are robbed of you for any amount of time, the last thing on people’s minds is frequenting the Pier Park Mall. 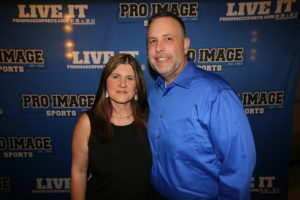 Lynn Haven residents Shena & Bryce Walsh at the 2018 Pro Image Sports Convention in Las Vegas. “The destruction has made a massive impact on the landscape and the local business owners trying to overcome the loss of tourist foot traffic. It doesn’t look or feel the same,” said Shena. 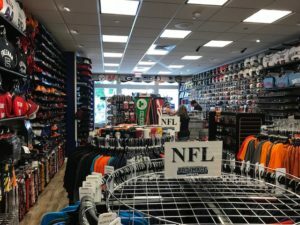 The Walsh’s opened their Pro Image Sports store in 2016. While the Walsh’s are quick to point out the damage their home and store incurred was minimal compared to the destruction suffered by so many, they join in the many local business owners adversely affected by the aftermath of Michael. Namely, no one is out frequenting local businesses while the community rebuilds. 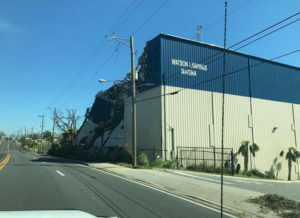 Destruction to local businesses on the Panama City side of the Harbor Bridge has limited foot traffic at nearby Pier Park Mall. Tenants of Pier Park Mall saw minimal damage, buy it was severe enough that business came to a screeching halt as the Walsh’s Pro Image Sports store was closed for 12 days. Most other tenants didn’t open for 20 days or more, and even then only on limited hours. Black Friday Weekend serves as the starting gun for the frenetic holiday shopping season. This year it served as the first of many milestones along the road of recovery for local business owners and residents. The Walsh’s are seeing local excitement over the success of the New Orleans Saints and University of Alabama. This holiday season the Walsh’s and many others are hopeful the local residents have a speedy recovery in the rehabilitation of their homes. During times of duress, sports serves as a reprieve from the stress. Those in the area, take the time to stop by, talk some sports, and find the perfect gift for the fan in your life.